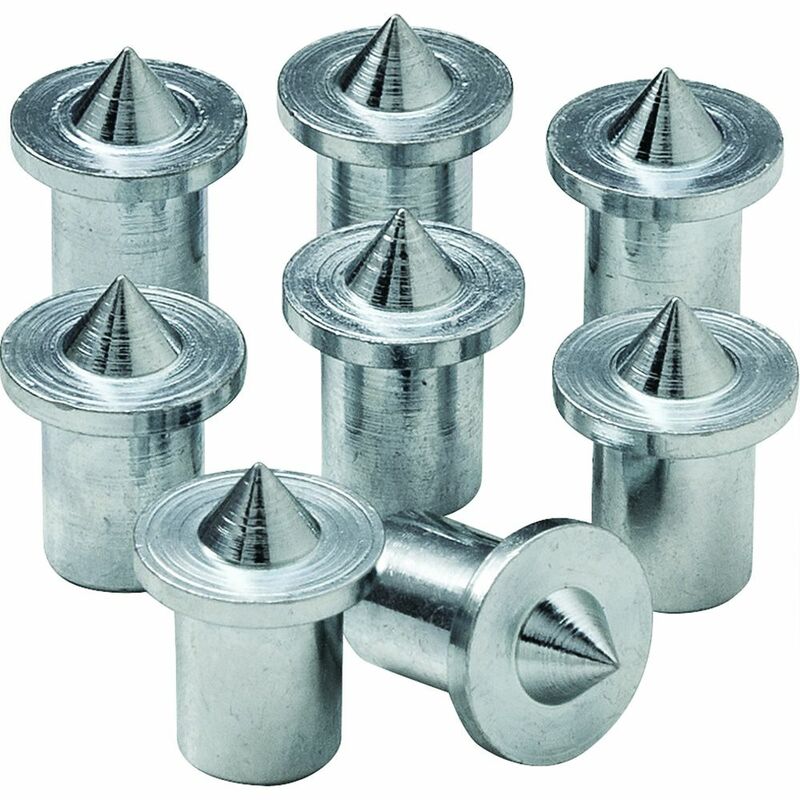 Dowel centers allow you to precisely transfer the location of one set of dowel holes to the corresponding holes in the other half of a doweled joint. Just drill one set of holes, slip in the dowel centers and press the joint together. The pins on the dowel centers will precisely mark the hole locations on the other member. Available in four different sizes (each includes eight transfer pins of whichever size you choose): 1/4", 5/16", 3/8" and 1/2". 1/4", 5/16", 3/8" and 1/2". What can I say, they are machined to fit tight in drill hole, therefore they work excellent. 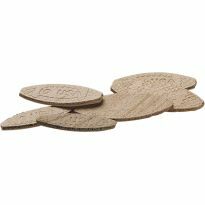 Used these to mark holes in table top. Worked perfectly. I tried using dowels for the first time. I was using biscuits. With theses pins I can Line up tap with a hammer and drill. My order was as described in your catalog, I'm happy with my order. Couldn't have completed my project without them! These are a real time saver! Instead of trying to perfectly align two separately drilled holes for the dowel, just drill the first hole, insert the dowel center, align the two boards where you want them, and the mark from the center shows you EXACTLY where to drill the mating hole...... Perfect alignment when the two pieces are joined! A must for aligning dowel holes to flat surfaces like table tops. These centering units do the job very effectively every time. Very handy for accurately marking boards for new dowel pins. I use them a lot. It really helps with dowel joints a lot. It makes it very easy to drill a hole in the right place. Totally worth to buy even for just that one project you are planning. 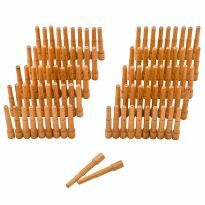 The dowel pins are excellent and the price was ok. Dowels are of good quality. I've dowelling jigs that cost a pretty-penny and still languish in my drawer. These little guys solve many problems. Not only do they accurately line-up mating holes for dowels but I primarily use them to expertly and quickly line up replacement wood drawer fronts for kitchen cabinets. 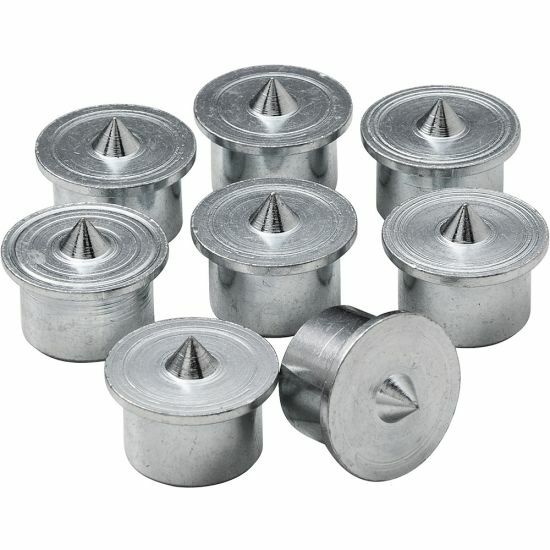 I've used these on many projects and they help line up where the dowel pins go perfectly. Makes this task so much easier. Glad to have in my workshop. They worked perfect everything lined up exactly . I was fully satisfied with these centers. I expected only 4 (I only saw in the past 4 per package) so this was a pleasant surprise. They worked well for the sole project I needed to complete recently. I am sure they will come in handy in the future. My only issue: where do I keep such a small specialty item without misplacing it, in a shop full of larger drawers and mismatches boxes? Any idea anyone? work as expected. used to replace the extension leaf on a table. I had purchased a bookcase kit from[discount store]and when attempting to install the top section found that the predrilled holes were not in the right location. I tried measuring with a trisquare but it did not work, was off a little. Found these dowel centers in Rockler catalog and purchased them. Used the 5/16&quot; centers and drilled the new holes and walla, perfect fit. Strongly suggest these for any application requiring dowels. Used to install a counter top where it was impossible to align the holes any other way. Didn't want to use screws or nails through a nice thick piece of mahogany so I doweled it in place. Very convenient and useful. 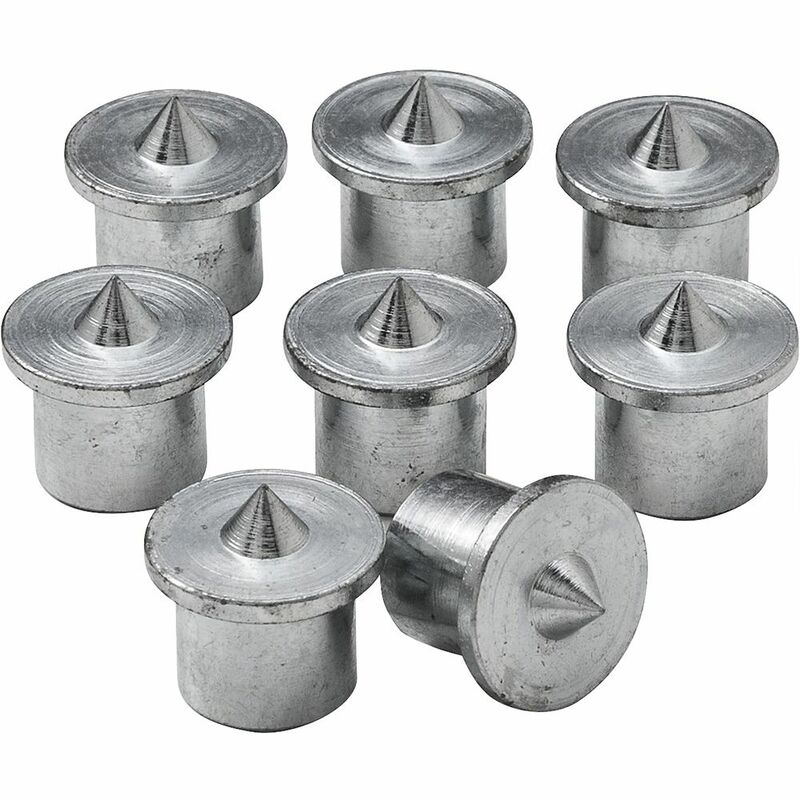 Used these for the first time just the other day and they fit the holes snugly and leave a noticeable impression when the part to be aligned is struck with a hammer. Definitely helps to align parts and ensure holes are accurately drilled. Glad that I purchased a set of these and will probably get a second set. I had made some of these when I was in school and they where very handy. Now that you can purchase them I will use them in my shop to transfer holes from one piece of material to another. Very simple and accurate method to locate dowels to mate matching pieces. Similar level of positioning accuracy as a biscuit joiner. I don't do much dowels work, but when l do, these little jobbers will make sure the match up holes are in the right place,that's half the battle. 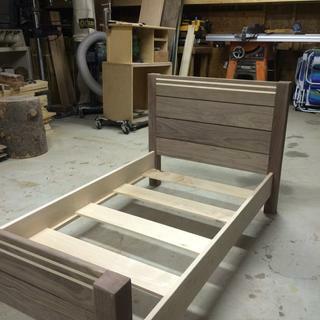 First time using dowel joinery. The dowel centers were extremely helpful. They fit snug but not too tight. They work really well. Sizes were all workable, but not consistent. Some slipped into the drill hole, others needed some persuasion, and a set of pliers to remove. Dowels are old fashioned, but sometimes they are the best way to do the job. They did a simple job well, although one was about 1/64' undersized. Much easier to align in awkward areas. Rockler's dowel centers are the only way I can invisibly join the parts of my sculptures and fine furniture. I wouldn't know what to do without them. Simple and effective. Dowels aligned well. I am using dowels to center and to lock down my removable workbench table tops. You guys always have what I need when I need it. I'm doweling two parts of a leaf from a drop-leaf table. Been making toy boxes from cedar and i find it easier to use the dowel pins for aligning the boards for drilling. I am a novice woodworker. 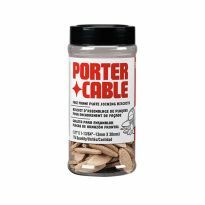 Good for mating up dowel holes with dowels. hoping it will help me find a plumb line, once and for all. I need them to line up parts on a project I am making. 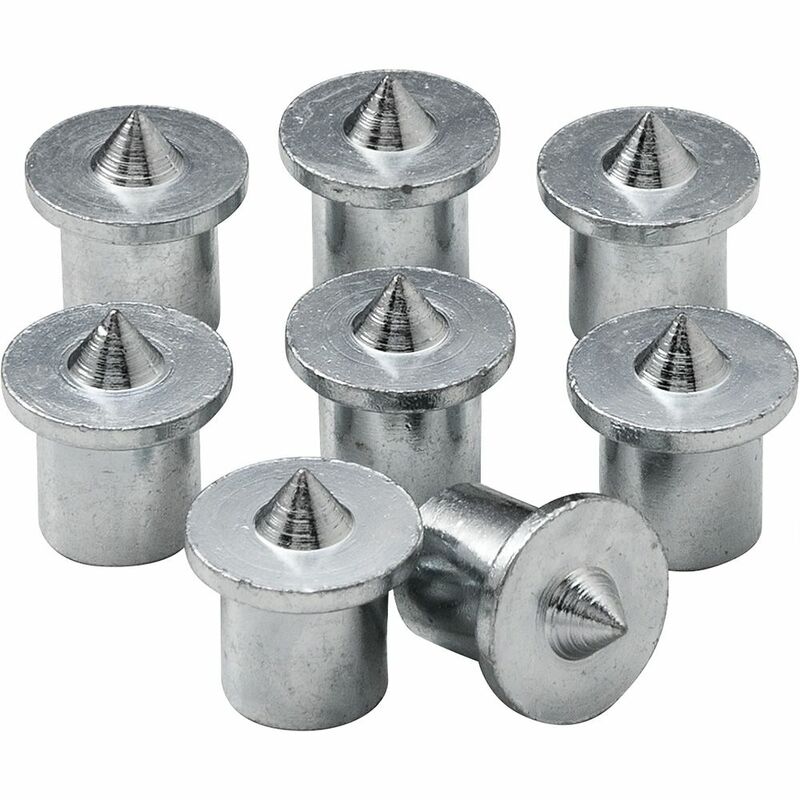 The only place that I can find a pack of this type which fits the drilled holes not over the dowel pins. It is the size I use for the items I make. Our current ones are getting very dull. They work great when they have a point on them. To use with the dowel jigs to locate hole placement. They are effective. They make creating joins much easier. Simple yet great idea. Because my design for a spice rack failed miserably because the holes didn't line up. Easiest way I can find to insure my dowels go where I want them too. is the 1/2" inside or outside diameter? 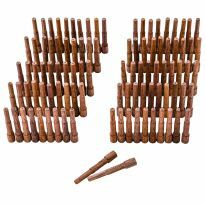 BEST ANSWER: The given value (1/2 inch) is O. D. of dowel center. Fits in 1/2 inch hole, for purpose of fitting a 1/2 inch dowel. It is the diameter of a dowel that is the same size as the narrower portion of the plug. 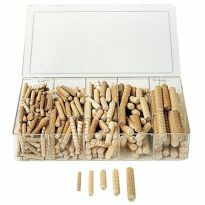 If the dowels your making is 1/2" these will fit inside the hole made from a 1/2" drill bit. Just like a dowel will. I haven't measured it exactly but it works perfectly with my 3/8" dowel set that brings drill bit and dowels, these centers make it very easy to line up the dowels perfectly. If you get the center's size that match the dowels are size then yeah they will fit. These centers are a real life saver. I highly recommend them. Hope this helps. Let's start over. You want to join two pieces of wood, # A and # B. Drill 1/2" holes in your piece # A. Put the 1/2" 'dowel centers' into those holes. Place your piece # B into the required position. Now tap # B with a hammer or mallet, forcing # B against # A. The 'dowel centers will puncture the surface of # B at the exact point you will need to drill. Drill your 1/2" holes in # B, put a bit of glue in each hole and the dowels. Press # A against # B and clamp. If clamping to a workbench top, don't forget to place a layer of wax paper under the joint .. so your project doesn't glue itself to the table top.